The Westminster Shorter Catechism is best known for its opening question: “What is the chief end of man?” To which the following reply is offered: “Man’s chief end is to glorify and enjoy God forever.” Hardly a more comprehensive and biblical answer could be imagined. This “ultimate question” is so comprehensive that it may accurately be applied to God himself with the same result: “What is the chief end of God?” Answer: “God’s chief end is to glorify God and to enjoy Him forever.” That is to say, everything God does in the world—especially His work of salvation—He does to further His own glory and enjoyment in the world. This great Puritan vision finds its source in the vision of the prophet Isaiah. The prophet Isaiah is writing almost one hundred years before Jerusalem’s destruction and her exile into Babylon. For several decades he has faithfully admonished the people against their pride and exhorted them to trust the Lord. Under the inspiration of God’s Spirit, he has warned them of coming judgment, devastation and exile. But as he brings his prophetic message to a close, he shifts from an emphasis upon judgment to an emphasis upon salvation. He has already announced the good news of the Lord’s saving work through Messiah’s vicarious atonement. Now, in these later chapters, Isaiah orients his audience to the happy results of God’s saving work. God will humble Zion’s pride through judgment. Yet in the end, there will emerge a remnant that has learned to humbly trust in the Lord. As a result, God will highly exalt them. And the glory which He would not share with the proud, He will delight to share with the humble. But that’s not all! God will share His glory with Zion not merely for her own benefit, but in order that Zion might share His glory with the nations. Thus, Isaiah’s message in chapter 60 may be distilled as follows: God accomplishes salvation in order that sinners might come to know and to make known His glory (thesis statement). My goal in this exposition is two-fold: (1) I want us to appreciate the high privilege we have as God’s people to experience and enjoy God Himself, and (2) I want us to sense the tremendous responsibility that we have to take what God has given us and to share it with the nations who are lost. And the LORD descended in the cloud, and stood with him there, and proclaimed the name of the LORD. And the LORD passed by before him, and proclaimed, The LORD, The LORD God, merciful and gracious, longsuffering, and abundant in goodness and truth, Keeping mercy for thousands, forgiving iniquity and transgression and sin, and that will by no means clear the guilty; visiting the iniquity of the fathers upon the children, and upon the children's children, unto the third and to the fourth generation. And Moses made haste, and bowed his head toward the earth, and worshipped (Exod 34:5-8, KJV). According to these verses, the revelation of God’s glory was not merely a visual experience, but it was an audible experience. It included a propositional revelation of God’s moral character (“merciful and gracious,” etc.) and His mighty deeds (“keeping mercy … forgiving iniquity … visiting the iniquity”). Thus, we may conclude from this passage that God’s glory is the revelation of God’s person and works which is both morally and aesthetically virtuous. That definition fits very well with our passage in Isaiah. The prophet uses two primary terms and a metaphor to convey the idea of glory. First of all, in verses 1 & 2, Isaiah uses the standard term for “glory” (כָּבוֹד), which refers to something that is “weighty” or “impressive” (cf. 13). When applied to a person’s character and deeds, it means morally honorable or virtuous (Prov. 21:21; 22:4; 26:1). According to Isaiah, God is going to reveal His virtuous character and deeds to His people in His work of salvation. Secondly, the prophet uses another term in the passage which means “to beautify” (תִּפְאֶרֶת), which denotes that which is aesthetically pleasing (Psa. 96:6; Isa. 28:5). This concept of beauty is often predicated of God’s moral character and deeds (Deut. 26:19; 1 Chro. 29:11). It is often used to describe God’s sanctuary—the place of His special presence (Psa. 96:6; Isa. 64:11). Not surprisingly, Isaiah applies the term both to God (v. 21) and to His sanctuary (vv. 7, 13). This word not only calls attention to the quality of God’s character, but it also highlights the pleasing experience of admiring God’s character. In addition to these two terms, Isaiah employs the metaphor of “light” (vv. 1-3, 19-21). The Bible uses this metaphor to convey God’s presence (Exo. 25:37; Lev. 24:2; 2Chro. 5:13-14; Psa. 4:6; Acts 9:3), especially in His work of salvation (Isa. 9:6; 42:6, 16; 49:6; 51:4; Mat. 4:15-16; Luke 2:32; John 1:4-9; 8:12; 12:46). Furthermore, the Bible also draws a connection between “light” and the joy God’s people experience as a result of God’s presence in salvation (Psa. 97:11; Esther 8:16; Jer. 25:10; John 5:35). Thus, “light” represents both the objective reality of God’s presence in salvation and the subjective experience of joy that follows as a result. The chief end of the gospel is not our personal well-being but God’s glory. And that is precisely the emphasis of Isaiah’s message. 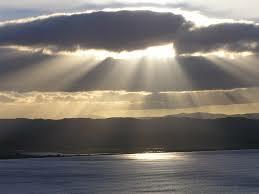 The prophet indicates this emphasis by placing the brilliant display of God’s glory as light both at the beginning (vv. 1-3) and at the end of the passage (vv. 19-21) as a literary inclusio (i.e., a kind of literary bracket or envelope). Everything in between indicates that the real focus of the passage is not merely what will happen for Israel but rather what God will do for Israel. In the language of verse 21, God makes Zion “the branch of [His] planting, the work of [His] hands, in order that [God] may glorify Himself” (Hithpa’el infinitive construct: reflexive verb introducing purpose clause). Thus, the gospel according to Isaiah and the rest of Scripture is all about God! Is that the way you conceive of the gospel? Why do you want forgiveness of sins? Merely to be rid of those nagging guilt feelings? Merely to have peace of mind? If that’s all, then the forgiveness you seek is not the one the Bible offers. According to the Bible, God forgives sinners in order to remove the barrier that our sins have created between Him and us (Isa. 59:2), so that He might dwell among us and have a relationship with us. Isaiah stresses this point by highlighting God’s return to His sanctuary in Jerusalem (v. 7, 13). Why do you want to be a Christian? To enjoy a better standard of life? Certainly the passage before us portrays salvation as a better standard of life. The passage speaks of offspring (vv. 4, 9, 22), material prosperity (vv. 5, 6, 9, 11, 13, 16, 17), real estate (vv. 10, 11, 21), and lack of enemies (vv. 14, 17, 18). Christians may enjoy these blessings in this life (Psa. 127:3; Prov. 10:1; Prov. 13:22; Prov. 16:7). But the Christian’s greatest possession is not the many gifts of God but the Giver—God Himself. As Asaph declared, “Whom have I in heaven but thee? and there is none upon earth that I desire beside thee. My flesh and my heart faileth: but God is the strength of my heart, and my portion for ever” (Psa. 73:25-26). Why do you want eternal life? Simply to avoid the pains of hell? Simply to be with your loved ones who have gone before? Simply to enjoy the beauty of a new heavens and a new earth? Where is God in that picture? According to the imagery employed by the Prophet Isaiah and later by the Apostle John, God Himself will be at the center of our solar system in the new heavens and new earth (vv. 19-20; cf. Rev. 21:23; 22:5) and our entire existence will forever revolve around Him! If that’s what you’re living for, then you have a handle on the gospel. If that’s not what you’re living for, then you have not yet appreciated the gospel’s chief end. The chief end of the gospel, though God-centered, is, nevertheless, for our personal and perpetual enjoyment. As we stated earlier, the light of God’s glory is the objective reality of His presence in salvation. In other words, God’s glory is who He is and what He has done for us in salvation. Thus the gospel is primarily about God. Nevertheless, as also noted earlier, the “light” of God’s glory is something subjectively experienced. To be precise, it includes the joy God’s people experience as they make God their all-in-all. The Puritans articulated this perspective in the Shorter Catechism Q1: “Man’s chief end is to glorify God and to enjoy Him forever” (emphasis mine). Let’s consider how this emotional response of joy in God is described in our text. The prophet has bid the people to look (with the eye of faith) in a circuit from the standpoint of Jerusalem (v. 4). As the people gaze out into the distance in all directions, they see the blessings of God’s salvation unfold right before their eyes. Their numerous offspring are restored (v. 4, 9, 22). Their land and city are fully restored (vv. 10, 11, 21). Their material wealth and prosperity are restored (vv. 5, 6, 9, 11, 13, 16, 17). Their enemies are either won over to their friendship (v. 4, 9-11, 14, 16), or they are completely annihilated (v. 12), resulting in blissful peace (vv. 17-18). All of these blessings constituted the benefits God promised to Israel when He brought them out of Egypt to inherit the Promised Land (Lev. 26:1-13; Deut. 28:1-14). But notice in verse 5 how God’s people will respond to the prospects of so great a salvation. Since the KJV rendering somewhat obscures the sense of the Hebrew, allow me to cite the NIV rendering which best captures the sense of the verse: “Then you will look and be radiant, your heart will throb and swell with joy; the wealth on the seas will be brought to you, to you the riches of the nations will come” (Isa. 60:5, NIV). I can still recall the thrilling experience of my college graduation ceremony. As we entered the doors of the Founder’s Memorial Amphitorium, we were greeted with the blast of trumpets and thunderous sound of the organ. The flags were raised and the multitudes of family and friends were standing to pay honors. Then, one by one, we filed across the front stage to receive our “well-done,” realizing all the while that it was only the grace of God that helped us finish the course. Needless to say, I was on an emotional high that whole day. Of course, the experience Isaiah describes is primarily future—it relates to the consummation of Israel’s salvation (cf. Isaiah 66:10-14). Nevertheless, one of the prophet’s purposes in proclaiming this vision to his contemporaries was to engender a kind of anticipatory joy in God amidst all their hardships and tribulation. In one sense, mourning and hardship has not yet ended for the believer. Many of us have come to appreciate Paul’s statement that “we must through much tribulation enter the kingdom of God” (Acts 14:22). In some cases, we may be suffering the consequences of our past sins. In other cases, we may be suffering the consequences of someone else’s sins. In still other cases, our suffering may be part of God’s mysterious providence. Yet, despite the ongoing struggles and temptations of this life, it is possible even now to experience that eschatological joy inasmuch as we have already begun to experience a saving relationship with God in this life. Thus, Paul can exhort believers to “rejoice in the Lord always” (Phil 4:4). Is this thought not also captured in Psalm 37:4: “Delight thyself also in the LORD; and he shall give thee the desires of thine heart.” If you delight yourself in God, then He Himself will be the greatest desire of your heart, and He will not leave that desire unfulfilled! Is the salvation you know bringing you greater joy in God? Does the gospel you are trusting call you to glorify God and enjoy Him forever? If not, then it’s not the gospel proclaimed by Isaiah—nor is it any gospel at all! Keep therefore and do them; for this is your wisdom and your understanding in the sight of the nations, which shall hear all these statutes, and say, Surely this great nation is a wise and understanding people. For what nation is there so great, who hath God so nigh unto them, as the LORD our God is in all things that we call upon him for? (Deut 4:6-7, KJV). They give of their wealth in tribute to rebuild and adorn the city (vv. 5-6, 9, 11, 16-17). They bring the finest animals of the flock to sacrifice in worship (v. 7). They help to rebuild the sanctuary and the city walls (vv. 10, 13, 17). The picture, then, is not that of nations grudgingly submissive to the Lord and Zion. Rather, the picture is that of nations enthusiastically allying themselves with Zion in order to serve Zion’s God. In other words, Isaiah is looking forward to the day when God will constitute a new Israel that will both enjoy and reflect His glory to the nations who in turn will join themselves to this new Israel and become worshippers of the living God! But before we can make application, we must determine the referent and timing of this prophecy. Exactly to whom does this prophecy apply? Does it apply to the ethnic Israel? Or does it apply to the Christian church? And when does it apply? Does it refer to the rebuilding of the temple and city under Ezra and Nehemiah? Does it refer to the missionary endeavors of the church from the Day of Pentecost to the end of the age? Or does it refer to some future blessing for the Jews? (1) Although Persia did contribute significant revenues and resources to help with the rebuilding of Jerusalem, neither the city, nor the temple, nor the people themselves measured up to the lofty language of Isaiah’s vision. Note especially that according to verse 21, the Zion Isaiah envisions will be constituted by genuinely righteous citizens. A perusal of Ezra, Nehemiah, Haggai, Zechariah, or Malachi will suffice to show that the prophecy could not have been fulfilled by post-exilic Israel. (2) There are a number of good reasons as seeing this prophecy beginning to be fulfilled in the Christian church throughout the church age. (a) First of all, Jesus ratified the New Covenant with His disciples in the upper room before His vicarious sacrifice as Jehovah’s Servant (Matt. 26:26-29; Luke 22:14-20). This group of Jewish disciples constituted the new Israel of God (Heb. 8:6-13). (b) Second, this new Israel of God began to shine forth the light of the gospel first to ethnic Israel, then to the Gentiles. In fact, the Apostle Paul justified his own ministry to the Gentile nations by citing a passage in Isaiah 42:6: “For so hath the Lord commanded us, saying, I have set thee to be a light of the Gentiles, that thou shouldest be for salvation unto the ends of the earth” (Acts 13:47). That passage in referring to the Servant of the Lord!” It seems that Paul saw Isaiah’s prophecy as beginning to be fulfilled in the church’s early missionary outreach. (c) According to passages like Ephesians 2:11-22, the enmity between the Jew and Gentile has been removed in the church, and now many Gentiles have been made “fellow citizens with the saints and of the household of God” (v. 19). This certainly seems to resemble the language of Isaiah’s prophecy where the nations ally themselves with the Jews and devote themselves to Zion’s welfare. Furthermore, the NT describes Gentile believers as the spiritually circumcised (Rom. 2:26-29; Phil. 3:3) and true seed of Abraham (Gal. 3:28-29). (3) There is also good reason to believe that Isaiah sees farther ahead into the future to a full and final salvation that will include ethnic Israel as well. (a) To begin with, there’s no good reason for minimizing the nature and scope of what Isaiah 60 promises. In other words, Isaiah does not just describe the beginnings of a better day. He is describing an era when all hostility is put down (v. 12) and removed (vv. 17-18). He is describing a time when the sorrow of God’s people has completely ceased (v. 20). Moreover, he is describing a time when God’s people will possess the land forever (v. 21). However we slice the pie—whether Palestine or the world—these things just ain’t happened yet! (b) Paul indicates in Romans 11 that there remains a future in God’s plan for ethnic Israel. At the founding of the Christian church, many ethnic Israelites were broken off the olive tree and many Gentiles were grafted in (vv. 17-20). However, Paul intimates that when the fullness of the Gentiles has come in at the end of the age, then a large number of ethnic Israel will also experience salvation as well (vv. 25-32). In summary, God has saved His people that they might serve their God. In particular, God has called them not only to enjoy but also to reflect His glory to the nations in order that the whole earth may be full of the knowledge of the Lord as the waters cover the seas (Isa. 11:9; Hab. 2:14). (1) Let us remember that our gifts and graces are ultimately not our own but have been given to us by God for the purpose that other men may be attracted to His glory. For who maketh thee to differ from another? and what hast thou that thou didst not receive? now if thou didst receive it, why dost thou glory, as if thou hadst not received it? (1Cor. 4:7). Isaiah would whole-heartedly agree. He has already labored for fifty-nine chapters to demonstrate to Israel that she has no basis for boasting in her own inherent ability or goodness. To the contrary, “all [her] righteousnessess are as filthy rags” (Isa. 64:6). Thus, Isaiah’s focus in this sixtieth chapter is not really upon Israel but upon the God of Israel. As John Oswalt notes, “Like a city gleaming in the light of the newly rising sun, [the people of Zion] shine with a beauty that is not their own” (The Book of Isaiah, 2:536). Thus, the nations are not attracted to Israel because she is inherently wiser or stronger or more virtuous. Rather, it is the virtue of God’s glory that they see reflected in a saved Israel that draws them to become citizens of Zion. Let us remembers that the gifts and grace with which God has endowed us have not been given in order to inflate our pride or enlarge our ego. They have been given so that men might make much of our God (1Cor. 1:26-31). (2) Let us be faithful to carry out our commission as Jehovah’s servant and take the light of the gospel to the ends of the world. Though Isaiah’s vision is primarily a promise of what will happen, we may also read it as God’s command to us of what should happen. Indeed, the first line opens with a double imperative: “Arise, shine, for thy light has come!” The Hebrew word translated “arise” (קום) does not merely mean stand up. Rather it usually carries the idea of rising for action (Deut. 13:17; 17:8; 27:43; Josh. 8:1; 1Sam. 23:4). Thus, we are called to rise for action. Ye are the light of the world. A city that is set on a hill cannot be hid. Neither do men light a candle, and put it under a bushel, but on a candlestick; and it giveth light unto all that are in the house. Let your light so shine before men, that they may see your good works, and glorify your Father which is in heaven (Matt 5:14-16, KJV). (3) Finally, let us look with eager expectancy for the day when God becomes the “Sun” around which we and a renewed earth revolve forever and ever. Though we rightly glory in what God is doing in our gospel age, there should also be a kind of “holy discontentment” with things as they are. We should long for the day when genuine peace and righteousness rule the world (v. 17). We should long for the day when God’s true worship is universal (vv. 7, 13). We should look forward to the day when all those who are Jews outwardly will become Jews inwardly through the imputed righteousness of their Messiah (v. 21; cf. Isa. 53). And when that day comes, God’s glory will no longer be limited to the eyes of faith. But with new eyes we all shall actually behold the aesthetic brilliance of God’s glory, especially as it emanates from the face of our exalted Savior, the Lord Jesus Christ (Rev. 5:12-14; 7:10-17; 21:22-27; 22:1-3). May the Lord hasten that day, as He has promised! (Isa. 60:22; Rev. 22:12)! Need Help Writing a Paper or Thesis?